* ... GOH: Karen Goh, who lost to Leticia Perez in the 5th District Supervisor race, is returning to Garden Pathways as president. The non profit organization mentors children, youth and adults to build productive lives. 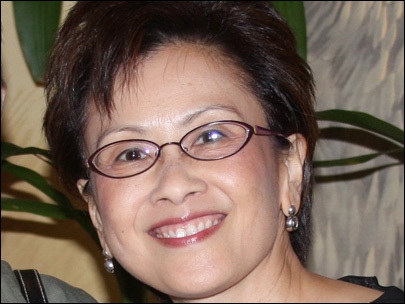 Prior to being appointed serve as a Supervisor, Goh served as the organization's executive director. * ... BOOM TOWN: The state high school wrestling championships held at Rabobank Arena brought thousands of visitors to town, and no place benefitted more than the downtown arts district. Restaurants were packed all weekend, and it was hard to find a seat and the downtown venues like Uricchio's Trattoria, the Padre Hotel and Chef's Choice Noodle Bar. Said one waitress at Chef's Choice: "I have never seen anyone like this on a Saturday. It's overwhelming." * ... CHILDREN FIRST: The Children First Campaign is offering five, $1,000 scholarships to groups or individuals that live or work within the Bakersfield City School District to help the lives of local children. Said Linda Fiddler: "The grants are based on a research study done by the Case Foundation. The findings indicated that when the ideas for projects are generated from within the target neighborhoods, not only were they more successful but also taught participants how to be powerful advocates for change. We are challenging our neighborhoods to think of projects that will improve the lives of children within the Bakersfield City School District service area." To apply go to www.childrenfirstcampaign.org. * ... TRASH: A local business executive dropped me a note expressing her frustration with our litter problem. The problem, as she noted, is that many of the offenders were reared in families and cultures where littering was acceptable. So what is the solution? "(Anti litter campaigns) are never going to succeed until people who litter start paying (fines) and/or doing community work. I don't understand why we have to assign money that we need in other areas, or that we simply don't have, to pay people to pick up trash when we should be making money thanks to those who don't care about the image of our city. I assure you that these people grew up like that, so the only way to 're-educate them' is to teach them a good, expensive lesson. And there are two places that hurt the most: our wallets and doing work that we hate to do." * ... TRASH THEFT: And speaking of trash, Patricia Henson of the Society for Disabled Children shared with me this problem involving two of their brown trash containers that were stolen recently from their Brundage Lane location. "The person who took the containers decided to dump out the trash all over the ground in front of our facility. The trash cans had been placed at the curb for regular pick up. So not only did we have to clean up the trash it will cost us $70 to get a new container delivered. What is truly sad is that the $140 this problem has cost could have been used to provide two or three out of town medical appointment trips, a month of STAR for one child. STAR provides assistance for children who are performing below grade level, two and a half weeks of speech and language therapy for a child or been used to support one of our other programs. What a sad commentary on our society when not even a nonprofit's trash cans are safe." This trash problem is really something else. I noticed trash already on the unlandscaped, award winning, Allen/Hageman exchange. I also had to pick up wind driven trash in my front yard this morning. It's a danged pain. Pet peeve: typos. Example from above. When will you be covering the arrest of Inga "I'm-So-Holy" Barks for public intoxication. Cannot wait! Suppose we will get to read her sad story in a confessional column. High quality talent! MAYBELLINE, I found your comment on typos quite ironic...smile.